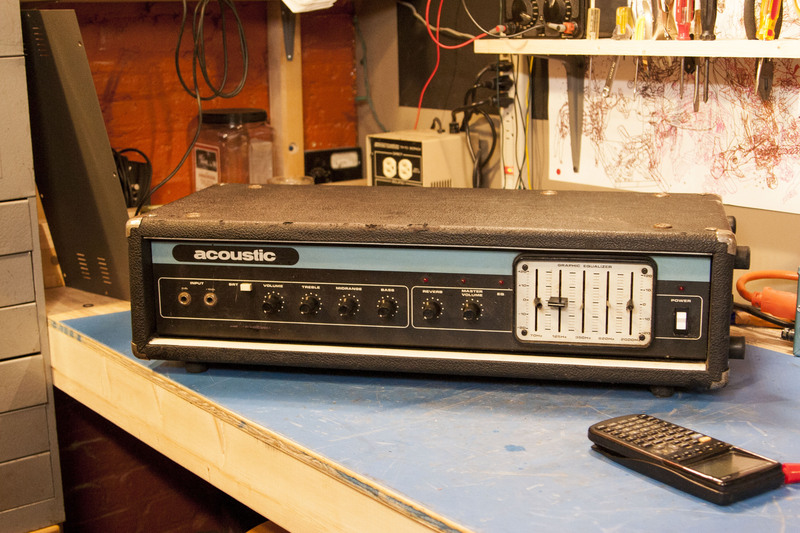 Vexing Acoustic 230 repair that just kept going. Amp was bought DOA for super cheap. Was received not able to be turned on. Had some rigged on/off switch that had broken but I actually had an identical or near identical switch as the original. Then it didn’t put out full power because of a broken connection on an interconnect wire from preamp to EQ board, then reverb didn’t work because of broken connection in reverb tank, then I realized 70 and 125Hz sliders in EQ weren’t working and L4 and L5 inductors needed to be replaced, then it worked great for a while but eventually would start to drift weaker and weaker in volume over time as the amp warmed up because of a thermal drift issue with Q5 transistor in the output section, wow. 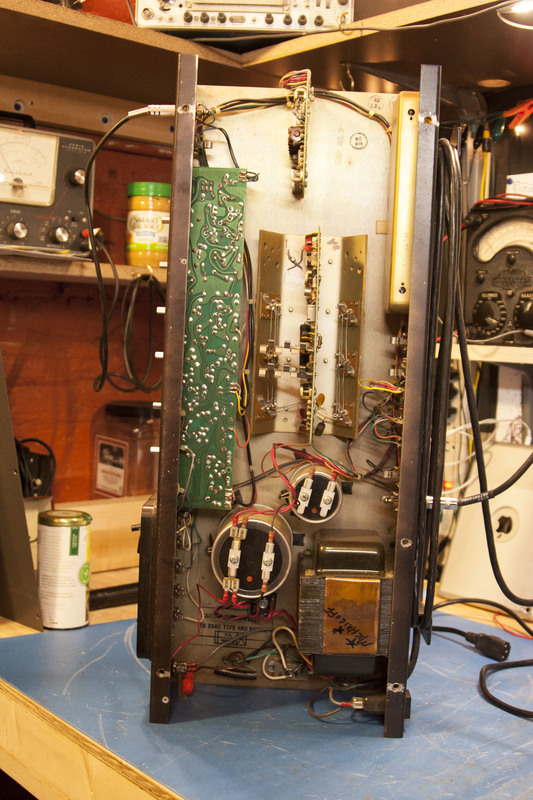 Kind of a hard amp to photograph but preamp board is on the left and held in place by mounting to the volume and tone controls on the front panel of the amp. EQ board is up top, output section is mounted to a large heat sink that is mounted to the bottom of the chassis. Output transistors are on the fins on the left and right of the output PCB, similar to Acoustic 370. If you want to see a cool trick I will pass it along. I was told what to do by some old gray beards when I was stumped so it’s not like I thought of this myself, by any means. Anyway, thermal drift problem (as opposed to some DC drift like from a leaking cap or something) had been narrowed down to output section somewhere but unsure where or what. I knew it was thermal because I could blow on the output section board and the signal would recover somewhat. Transistors I guess would be first culprit, then caps then resistors, I would guess. Anyway, you can get a q-tip, get the end wet, sandwich it between some ice packs for a few seconds and it gets really cold and you can use it as a cold probe. Without shocking yourself or shorting out other things in the circuit with this wet, conductive probe, touch the transistor bodies to cool them down and see if the signal recovers. You will have to let the amp run for a while, like 20 minutes in this case, so it can get warm and the signal good and weak. Check it out. Also here is the Acoustic 230 schematic.